In a closed primary election, only voters registered with a political party that has qualified for a primary election may vote. They may only vote on ballots for their registered political party. In Colorado, over 37% of registered voters do not identify with one of the major parties.1 Coloradoans recently voted to open their primaries through approval of Proposition 108, which opened all of Colorado's primaries, including presidential, congressional and state races. 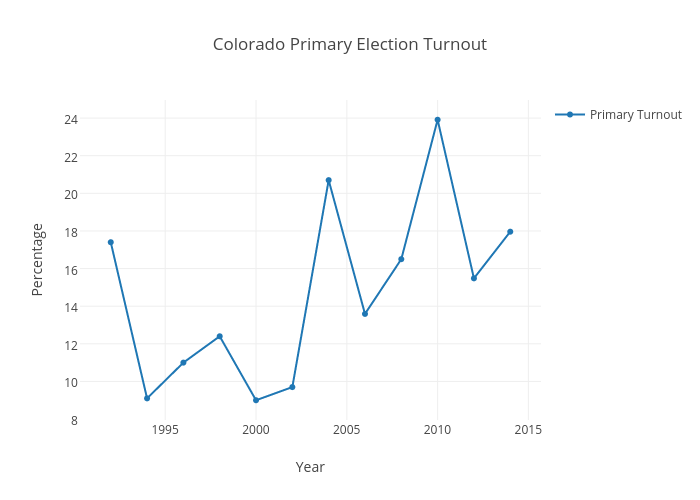 Previous to November 2016, Colorado conducted caucuses instead of presidential primaries, and their congressional and state elections involved closed primaries. In the November 2016 election, voters approved Proposition 107, which brought presidential primaries back to the state, and Proposition 108, which opened both those new presidential primaries, as well as congressional and statewide races. House Bill 15-1354 has been proposed which would create an open primary system in Colorado.11 The Bill has been indefinitely postponed. In 2014, there was an effort to put an initiative on the ballot which would change Colorado's primary system to a top-four system.12 In a top-four system, all candidates are placed on the same ballot and all voters have access to that ballot. The top-four vote-getters proceed to the second stage of the election. Ultimately, the measure did not make the ballot as proponents withdrew support, deciding to seek the ballot in 2015 instead. Colorado’s laws create a system which bars over 37% of its electorate from participation in the primary election process. 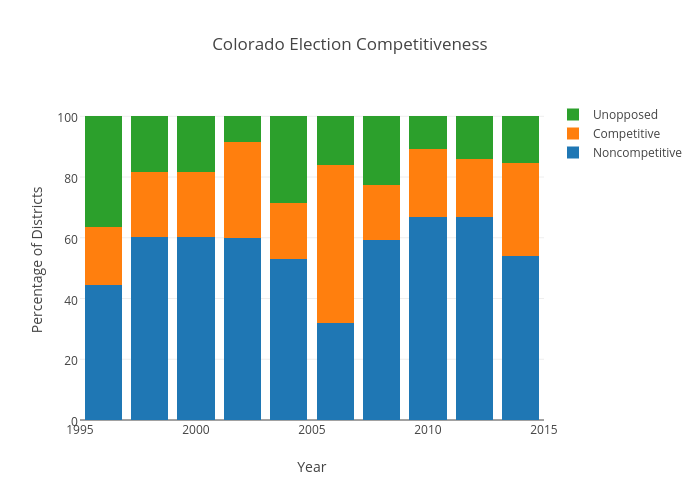 Based upon election competitiveness statistics, Colorado's primary is often the only election that has a material impact upon who ultimately gets elected. These elections are also paid for by tax dollars. Therefore, the system is questionable under both the U.S. and Colorado Constitutions. All political power is vested in and derived from the people; all government, of right, originates from the people, is founded upon their will only, and is instituted solely for the good of the whole." Relevant Portion: "All elections shall be free and open; and no power, civil or military, shall at any time interfere to prevent the free exercise of the right of suffrage." Relevant Portion: "No person shall be deprived of life, liberty or property, without due process of law." Relevant Portion: "No appropriation shall be made for charitable, industrial, educational or benevolent purposes to any person, corporation or community not under the absolute control of the state, nor to any denominational or sectarian institution or association." Relevant Portion: "Every citizen of the United States who has attained the age of eighteen years, has resided in this state for such time as may be prescribed by law, and has been duly registered as a voter if required by law shall be qualified to vote at all elections." Relevant Portion: "The general assembly shall pass laws to secure the purity of elections, and guard against abuses of the elective franchise." Relevant Portion: "(1) This code shall be liberally construed so that all eligible electors may be permitted to vote and those who are not eligible electors may be kept from voting in order to prevent fraud and corruption in elections." Relevant Portion: "(1.2) "Affiliation" means an elector's decision to affiliate with either a political party or a political organization, as defined in subsections (24) and (25) of this section. (12) "Elector" means a person who is legally qualified to vote in this state. (22) "Major political party" means any political party that at the last preceding gubernatorial election was represented on the official ballot either by political party candidates or by individual nominees and whose candidate at the last preceding gubernatorial election received at least ten percent of the total gubernatorial votes cast. (23) "Minor political party" means a political party other than a major political party that satisfies one of the conditions set forth in section 1-4-1303 (1) or has submitted a sufficient petition in accordance with section 1-4-1302. (25) "Political party" means either a major political party or a minor political party. (49.5) "Unaffiliated" means that a person is registered but not affiliated with a political party"
Relevant Portion: "Except as provided by section 1-4-1304 (1.5), only a major political party...is entitled to nominate candidates in a primary election. All nominations by major political parties for candidates for United States senator, representative in congress, all elective state, district, and county officers, and members of the general assembly shall be made by primary elections. All expenses incurred in the preparation or conduct of the primary election shall be paid out of the treasury of the county or state, as the case may be, in the same manner as for general elections." Relevant Portion: "A minor political party may nominate candidates for offices to be filled at a general election by petition. A minor political party may nominate candidates for offices to be filled at a general election by assembly. An assembly shall be held no later than seventy-three days preceding the primary election. If an assembly designates more than one candidate for an office, or if an assembly designates one or more candidates and one or more candidates qualifies by petition, the candidate of the minor political party for that office shall be nominated at a primary election held in accordance with this code. Nothing in this section shall be construed to prevent any eligible elector associated with a political organization that does not qualify as a minor political party in an election from qualifying for the ballot by petition as an unaffiliated candidate." Relevant Portion: "Any registered elector who has declared an affiliation with a political party that is participating in a primary election and who desires to vote for candidates of that party at a primary election shall show identification...write his or her name and address on a form available at the voter service and polling center, and give the form to one of the election judges. If the name is found on the registration list, the election judge having charge of the list shall likewise repeat the elector's name and present the elector with the party ballot of the political party affiliation last recorded. If unaffiliated, the eligible elector shall openly declare to the election judges the name of the political party with which the elector wishes to affiliate, complete the approved form for voter registration information changes, and initial the registration list in the space provided. Declaration of affiliation with a political party shall be separately dated and signed or dated and initialed by the eligible elector in such manner that the elector clearly acknowledges that the affiliation has been properly recorded. Thereupon, the election judges shall deliver the appropriate party ballot to the eligible elector. Eligible electors who decline to state an affiliation with a political party that is participating in the primary shall not be entitled to vote at the primary election." Relevant Portion: "Any unaffiliated elector at a primary election may cast a regular party ballot upon openly declaring to the election judge the name of the political party with which the elector wishes to affiliate"
For a public purpose to exist when considering Article V, Section 34 of the Colorado Constitution, the legislation must demonstrate a discrete and particularized public purpose which, preponderates over any individual interests incidentally served by the statutory program. In the Colorado Constitution, equal protection is included within due process of law. Although the language of Colo. Const. Art. V, § 34 seems to suggest that no private entities can ever receive public funds, it is still constitutional for those entities to receive public funds where the apportionment serves a primarily public purpose. "[T]he right to vote is at the core of [Colorado's] constitutional system and is a fundamental right of every citizen." "[Colo. Const. Art. II, § 5] means that every qualified elector shall have an equal right to cast a ballot...and that no act shall be done by any power, civil or military, to prevent it." 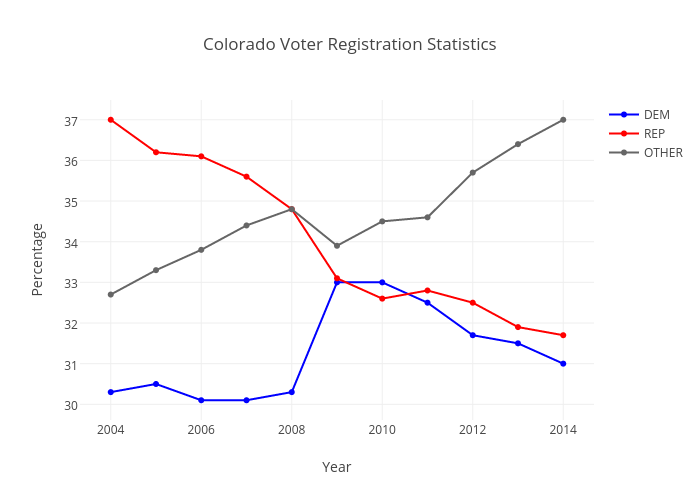 Colorado's registration system was challenged. Voter registration was cancelled if the notice of registration in the mail was returned as deliverable. The system was upheld as a means of confirming residency requirements for electors.